Is Your Life in “PEACE” or in “PIECES”? that will saturate their lives and flow over and have an impact on all around them. The course is presented through Word based teaching in a unique way incorporating many creative learning tools including group work led by facilitators and allocated times for the individual to seek and hear from God.Practical learning tools have been incorporated into the course, e.g. a puzzle and a treasure chest to help the ladies. Many of the sessions have been filmed out in nature, on the beach in the mountains etc. and adds a lot of creativity and interest to this course. The Prince of Peace – Who governs our lives? We focus on positioning ourselves according to God’s order. Cornerstones of peace are put in place. Woman of Peace – Rediscovering our identity, and learning to see ourselves through God’s eyes. This lesson is based on the Song of Songs. The Peace Warrior or Worrier in Pieces? This lesson empowers you to walk in peace and victory. Have you learned the secret of walking with a victorious spirit and displaying peace when facing difficult situations? The world is desperately crying out for peace. I believe that the Spirit of God is raising up a company of women whose peace will not depend on outward circumstances but on a deep love relationship with their God. From this source, will flow a river of life and peace that will saturate their lives and flow over and have an impact on all around them. The Woman of Peace Course has changed my vision – it has shifted from my own issues to God’s greatness, in that I have experienced God’s joy and peace coming into my life. God has healed me and given me a new purpose. I have been drawn to look at Jesus as the Lover of my soul. To enjoy His closeness and dance with Him. To look at myself through His eyes as one who has found peace and I am His beloved daughter. The Woman of Peace Course has changed my vision – it has shifted from my own issues to God’s greatness, in that I have experienced God’s joy and peace coming into my life. God has healed me and given me a new purpose. I have been drawn to look at Jesus as the Lover of my soul. To enjoy His closeness and dance with Him. To look at myself through His eyes as one who has found peace and I am His beloved daughter. I was very bitter, angry and broken but I have victory, deliverance and have been set free. I have found true peace in most areas of my life. The Woman of Peace Course has changed my life for the better, it transformed my life and there has been a change in my family. I have learnt more about the Word and how to apply the Word of God to my life. I lived for 49 years believing I was at peace, but God came and showed me that I had outer peace, but the devil stole my inner peace with his lies for so long. I found my inner peace in Him.. So much has changed within me. As a woman God came and made me still within. It is a kind of quiet, still that I have never experienced before. God is busy working in me and for me personally. He had to first make me “quiet” in order to receive from Him the peace I now have. I lived for 49 years believing I was at peace, but God came and showed me that I had outer peace, but the devil stole my inner peace with his lies for so long. I found my inner peace in Him.. So much has changed within me. As a woman God came and made me still within. It is a kind of quiet, still that I have never experienced before. God is busy working in me and for me personally. He had to first make me “quiet” in order to receive from Him the peace I now have. I have realized that God loves me so much and that He sees me as precious and beautiful. I know now my identify is in Him. I am His child and His beloved. I have realized that God loves me so much and that He sees me as precious and beautiful. I know now my identify is in Him. I am His child and His beloved. I really went through a deep cleaning experience where God really opened my eyes to past hurts. He has cleansed and set me free – Hallelujah! It made me realise that I am a woman in peace, not a woman in pieces! God is my warrior. This course has impacted my life by understanding my position in Christ. Yielding into His goodness and understanding His love for me. Being transformed from a woman of shame, condemnation and guilt to a woman of peace, passion and purpose. This course has driven me to impact other women’s lives, by showing and teaching them about Gods love for us and to have an intimate relationship with Christ. This course has taught me about family values and to seek His face every day. To feel His warm embrace every day. To see women being set free from bondages, shame, forgiveness, brokenness and hurt. To see them being transformed from all of these to see complete freedom. To see them feeling worthy again. This course unlocked treasures that we as women were not even aware of. To be able to be in His presence with complete peace and love in your heart. God has unlocked values in my life that I have the passion and desire to impact as many woman as I can. Giving Him all the glory and Honour. By impacting other woman’s lives they in return impacts lives as well. 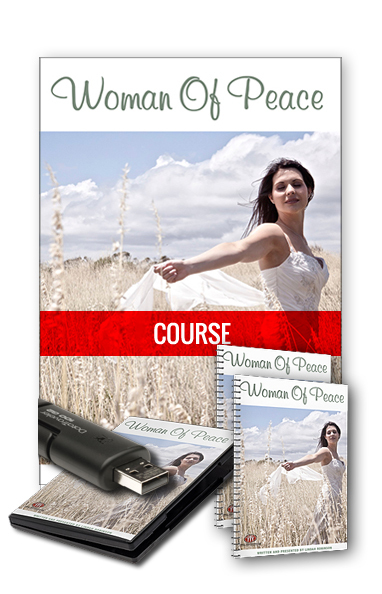 This course are doing wonders in woman’s lives and there is such an anointing on it. I thank God the He uses a woman like Linda, humble and obedient to work through to impact so many women’s lives. Thank you Linda may His light, favour and wisdom always shine upon you. Through this course I have learnt to be more patient and to have a lot of peace, not just with myself and family, but with everyone around me. Once you have been trained, course materials can be purchased to present the seminar. The starter pack consists of 5 seminar DVDs, or memory stick, a participant’s manuals and 1 facilitator’s manual. You do have the option of buying the DVDs separately. Extra manuals can be ordered as and when required.